Motorola has unleashed its latest Android Flagship handset Motorola X which seems to be an elder brother of Motorola G, when it comes to chassis. We are going to demonstrate a precise comparison of both ‘siblings’ to ease up our users to make an apt decision that which handset appositely suits their needs. Question wandering in people minds that keeping into fact Moto X reasonable price, what it would offer to its customers which MOTO couldn’t? What made Motorola think about unveiling another feature handset that ultimately expanded Moto family altogether? Let’s satiate all such intuitions by undergoing a head to head comparison between these two! Moto X is integrated with Super 4.7’’ AMOLED touch display bearing 720p High Display resolution. On the other hand, Moto G loosened some numbers owing to its relatively short but exorbitant 4.5’’ LCD Display which makes videos and images amazingly standout. Bear in mind, Moto G share same picture resolution as that of its successor i.e. 1280×720 p.
5 MP high resolution rear camera of Moto G is nonetheless a treat to experience. Video-callers and selfie lovers, Hold your nerves as you would be quite excited to know that this sophisticated grotesque also support 1.2 front camera. BUT Moto G can’t stand its contender’s HD 10 MP camera coupled with 2.1 front facing camera. So without an aura of doubt, we can state that Moto X owing to its premium camera, can render a stunning impact on its possessor because of its spectacular color contrast and image sharpness. Moto X is engineered with Dual core processor clocked at 1.7 GHz whereas Moto G left no room for its brother to give it some competition, thanks to its 1.2 GHz Quad core Qualcomm 400 processor. So Moto G leads the marathon when it comes to disruption free processing speed. Moto G was originally available with Android 4.2 Jelly Bean but recently it has been updated to KitKat 4.4, thus now both of them possess similar OS and are Neck to Neck in this particular spec. Moto X is introduced in the market with built-in memory of 16 GB or 32 GB. So now you can store heaps and stacks of data without giving any forethought to the memory storage your data will entail. Whereas Moto G showed up with built-in 8 GB or 16 GB memory with no expandable memory slot. Absence of Micro SD card slot in both gadgets speaks volume about Google intention to steer users towards its Cloud services. In Moto X , incorporated 2 GB of Ram which enables number of applications run side by side whereas Moto G could only come up with 1 GB , thus another pull back! The price tag of SIM-FREE Moto X 16 GB (£ 380) outstripped SIM FREE Moto G of same built in memory (£ 159) but wooden touch in former’s rear casing along with other high end specifications worth the price hike. 2070 mAh battery in Moto G seems like a joke as its quad core heavy processor won’t let this flagship gadget surpass one day easily , though its Power Management is quite optimum. 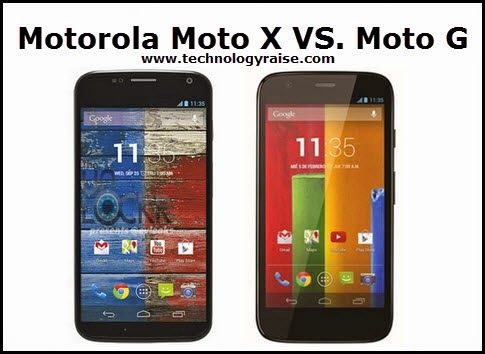 On the contrast, 2020 mAh battery juice in Dual core Moto X made Motorola’s legend not less than a Megastar. When it comes to Moto G vs. Moto X, both gadgets have somehow more or less same specs but we would give Moto X an edge over its counterpart owing to its blazingly high end camera and super large display. High speed processor of Moto G won’t stand low battery fluid of 2070 mAh for a day so consequently, a major drawback which pushed it in secondary position in term of customers’ preferences.